Question: if Iron Man can fly, why has he stumbled into every pitfall of the superhero genre? His game is messy, confusing and, at best, about as good as Catwoman or Batman Begins. Which is not good at all. In this game of the film of the comic, you are the titular Iron Man - disabled billionaire inventor Tony Stark - in his rocket-booted iron suit, out to thwart evildoers. At heart it’s a shoot-’em-up with a great deal of air-to-surface combat, although you can land anywhere and punch things. Mostly though, the gameplay boils down to ‘shoot orange targets - blue targets optional’. Worse, there’s zero skill involved in the shooting itself - holding the button fires your repulsors just as quickly as tapping it rapidly, and the auto lock-on makes it impossible to miss, even from miles away. 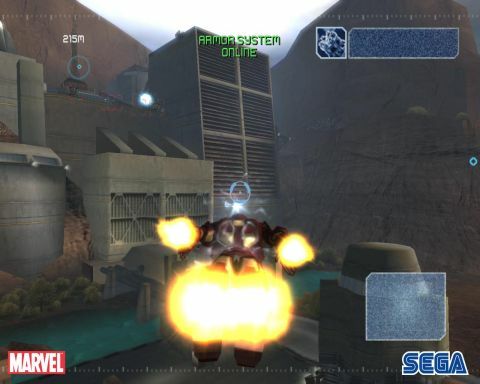 The game doesn’t even start you off well - Iron Man’s graphics look their worst at ground level, so introducing you to the game without the ability to fly is, while chronologically accurate, a mistake. Besides, ground combat is worse than in the air, especially as Stark’s initial weapon is the least enjoyable flamethrower of any game ever - it can’t even set cloth awnings alight. Once airborne, occasionally - through fast-changing objectives - you’ll lose track of what you’re doing, and the game will just keep respawning enemies until you figure it out. But some levels require you to withstand such an onslaught, so it’s hard to know whether your enemies are meant to be attacking in waves, or are just respawning because you’ve not triggered the next event. There’s no way to tell. The AI is poor too, often unable to move around obstacles. However, there is actually some skill needed to succeed. Tactical play is possible, with various useful abilities - re-routing power to your thrusters, life-support, weapons and melee attacks on the fly. It does feel like you’ve got a state-of-the-art robo-suit at your command. But in the end, success almost always comes down to trial, error and the ‘restart mission’ option. Description Tony Stark's supertech piece of armor blasts onto the next-gen scene in time for the 2008 movie.